Aaron Martin scores for Brighouse against AFC Mansfield last weekend. PIC: Steven Ambler. Providing there are no more postponements - a tall order given the infamy of the British weather - Brighouse Town now know their remaining 15-match schedule as they eye the Evo-Stik East title. Their outstanding game with leaders Morpeth Town was re-arranged this week by the league management. Thomas Haigh scored Town's second goal last weekend. PIC: Steven Ambler. Second-placed Town’s game on March 23 against Tadcaster Albion has been moved to the vacant date of February 9 while the Morpeth contest will now take place on March 23. This gives Vill Powell’s side three home games on the bounce following the vacant weekend this Saturday. They then follow that run up with a trip to bottom-club Stocksbridge Park Steels on February 16. Town soon return home, however, as they host South Yorkshire club, Frickley Athletic on February 23. The upcoming run of home games is music to the ears of the hard-pressed committee after a barren spell, Town having only had two home games in their last eight matches. Powell and his coaching staff are more than pleased, although they would have liked to have continued with a fixture this weekend after impressive victories over Belper Town and AFC Mansfield. “Once you have the momentum and confidence is high, it’s always best to continue forth rather than have a break,” commented Powell. Brighouse remain just three points behind league leaders Morpeth after securing a 3-0 win over the improving AFC Mansfield on Saturday afternoon. 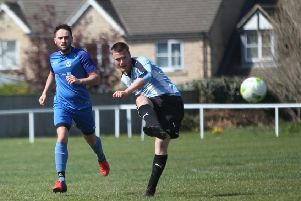 The victory saw Town’s centre forward Aaron Martin become the section’s leading scorer with his 17th goal of the season and his 36th since joining the club in 2017. Town, with a westerly wind at their backs in the first half, went two goals ahead via Martin and Tom Haigh. After surviving a spell of pressure from Mansfield in the first 20 minutes of the second half, Town finally put their seal on the game in the 73rd minute when Adam Jones scored to make it 3-0. Co-assistant manager Stacy Reed said: “It was a great win in what was a difficult game made harder by the gale force winds. “I thought we dealt with the conditions really well and deservedly went 2-0 up in the first half. In the second half, with the wind, AFC Mansfield put us under pressure from the off but the defence and keeper Jordan Porter were solid once again.